Summary: Rain moves in tonight, leaving us with a possible wet Memorial Day and severe weather chances on Tuesday. *Note: We are now only posting to the site when significant weather is expected, so posts will likely only be made a few times a week, but more during severe/significant weather. Follow us on Twitter for more up-to-date info. It’s been a great weekend so far, and a great start to your Sunday, but rain is expected to move in and put a damper on our holiday and beginning of our short work week. For today, expect sunny skies early with some clouds building later. The high is expected to be about 84 degrees with a 20% chance of rain and thunderstorms mainly after 1pm. Winds are a bit gusty out of the south southeast at 15 mph, with gusts up to 25 mph. Here’s a look at the HRRR model loop of what it thinks could happen (keep in mind this model is updated hourly). This loop starts at 9am this morning and ends at 11pm tonight. Tonight, our rain chances increase to 30% with our overnight low dropping to 68 degrees. Winds will still be gusty from the south southeast at 10 to 15 mph, with gusts as high as 25 mph. Memorial Day is likely to be wet. Unfortunately our nice weather for the weekend comes to an end and rain starts to build in during our cookouts for Memorial Day Monday. For Memorial Day, our high temperature will be about 78 degrees with a 60% chance of rain and storms. Winds will be out of the south at 10 to 15 mph with gusts up to 20 mph. It’s also going to be muggy too with the south winds bringing in dew points of 60 degrees. For Monday’s rain chance we go to the NAM4 model to see what they say about rain. 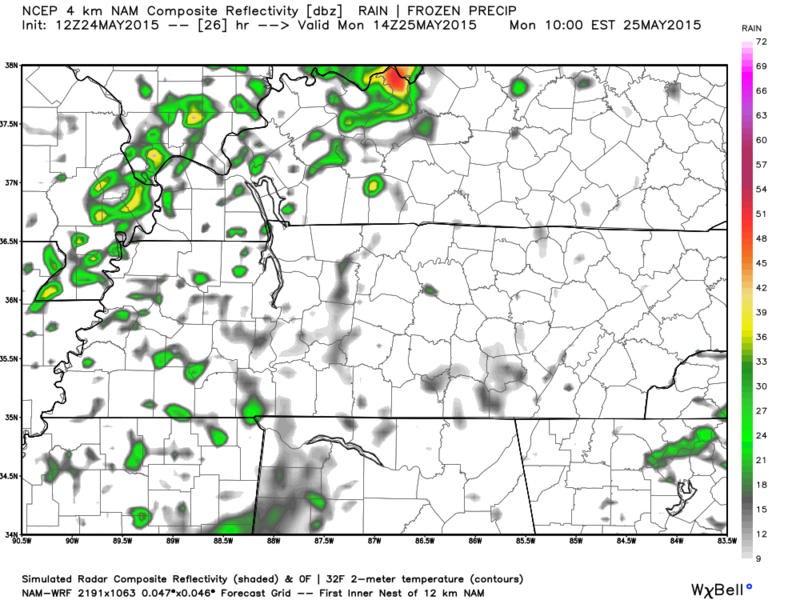 NAM4’s simulated radar is showing that at daybreak there is likely to be some spotty showers around most of Middle Tennessee. Here’s the simulated radar for 5am. 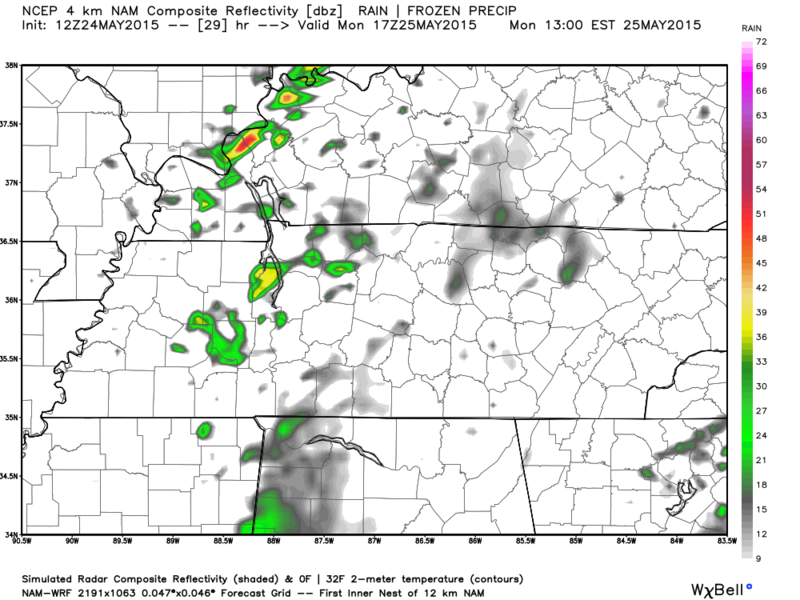 There might be some mid-morning clearing of showers according to NAM4’s simulated radar. Here’s a look at 10am. Shower possibilities start turning more isolated as the day goes on. Here’s NAM4’s simulated radar for 1pm. 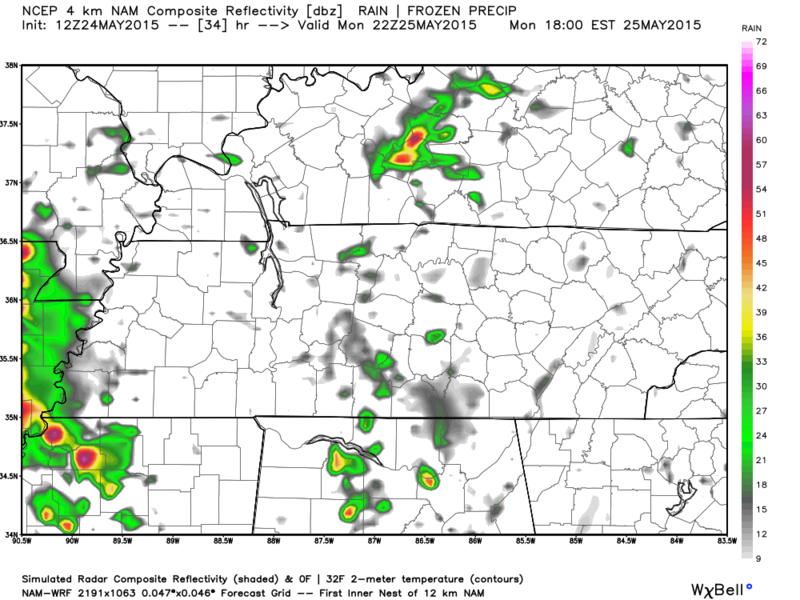 Finally, here is NAM4’s simulated radar for 5pm. Memorial Day Q&A: Is it going to rain all day? : No. Is it going to be a washout? : No. Do I need to worry about getting wet? : Yes. Should I make an indoor plan in case of rain? : Yes. Should I grill burgers, steaks, or hot dogs? : Yes, yes, and yes. Cookies or pie? : Yes. Memorial Day overnight into Tuesday our rain chances stay at 60% while our overnight low drops to 67 degrees. The beginning of a short work week will be dicey. If going to work the day after a holiday doesn’t sound fun, you may end up having to do it with a chance of severe weather about. Tuesday we are looking at another 60% chance of rain and thunderstorms with a high temperature of about 79 degrees. Winds will be from the south at 10 to 15 mph, gusting up to 20 mph. The Storm Prediction Center has outlooked us for severe weather possibility for Tuesday in the SLIGHT category. This is valid from 6am Tuesday to 6am Wednesday. The SLIGHT category means there is a 15% chance of seeing severe weather within 25 miles of a point. AT LEAST WEAK TO MODERATE BUOYANCY AND A RELATIVELY STRONG WIND FIELD /PARTICULARLY TN VALLEY NORTHWARD/ COULD SUPPORT ORGANIZED STORM MODES WITH DAMAGING WINDS/HAIL AND POSSIBLY A TORNADO OR TWO. WINDS AND HAIL MAY BE POSSIBLE WITH STRONGER THUNDERSTORMS. Daytime heating will make any possible showers/storms stronger, so these storms could strengthen enough to be severe and cause some damage. Wednesday will likely be wet too. Wednesday comes with a 60% chance of rain and thunderstorms and a high temperature of about 81 degrees. We’ll have more details on Wednesday in our next post.